Critics have denounced the Scottish Government for backing a proposed ban on smacking, warning of “dire” consequences. Last week, the Scottish Government said it would “ensure” a Bill that criminalises parents who smack their children becomes law. The idea was put forward by Green MSP John Finnie in a Member’s Bill. Over the weekend commentators Brendan O’Neill, Kevin McKenna and pro-family campaign group Family First New Zealand all spoke out against the move. O’Neill, Editor of online magazine Spiked, said a smacking ban would be “deeply worrying” and “an attack on parental sovereignty and familial privacy”. He said that smacking is not “violence” or “assault”, as the intention is “to discipline and educate”. Writing in the Herald on Saturday, journalist Kevin McKenna said a ban “carries the risk of depleting the resources of already hard-pressed social workers in their attempts to deal with real abuse of vulnerable children”. McKenna believes the SNP is “bent on turning Scotland into a fantasy state” where “middle-class dilettantes” can “indulge their cultural fads and fetishes about how the working classes ought to behave”. Family First New Zealand called on Scottish people to oppose the ban and said there has been a “chilling” effect on parents since it was outlawed in its country. New Zealand brought in a ban on smacking children in 2007, but 87 per cent of the population voted against the law in a 2009 referendum. Bob McCoskrie, the national director of the group, said: “The law has had a ‘chilling’ effect on parenting and rather than tackling rotten parents who are abusing their children, it has targeted well-functioning parents”. “We would warn Scottish parents that this law will harm and rip apart families”, he added. Last week, Be Reasonable Scotland demanded a new consultation on the issue as the previous exercise was carried out during the summer when families were on holiday. The campaign group, backed by The Christian Institute and The Family Education Trust, also revealed an opinion poll which showed three quarters of parents oppose a smacking ban. 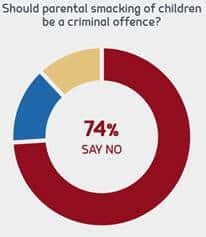 When asked to consider the statement, ‘A ban on smacking would likely criminalise reasonable parents while doing little to stop bad parents from abusing children’, 75 per cent agreed, with just one in eight (13 per cent) disagreeing.